Kalandra Jane - Millinery and Musings! : New Pattern! I just received this pattern in the post from PatternCenter on etsy. 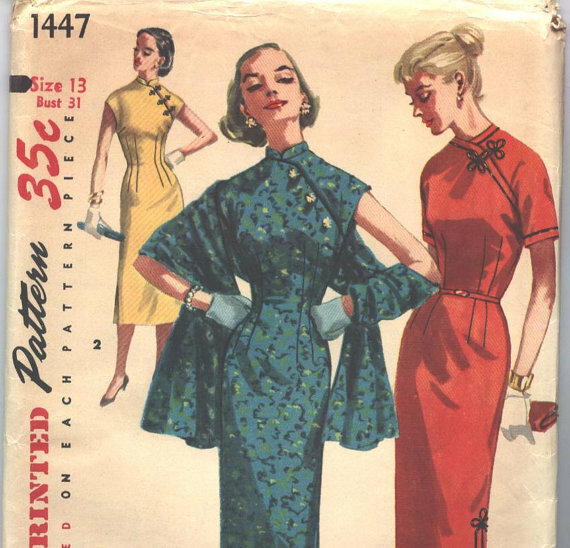 I've been looking for a vintage bolero pattern for so long! They're usually either way too small, or close at the neck which isn't the look I want. I tried drafting my own, but it ended up fitting badly so I'm glad to have this basic pattern in my collection. Look at this amazing Oriental dress pattern in the Pattern Center etsy shop! No wonder the woman on the envelope looks so smug. If you have a bust that's only a bit bigger than one of my legs, it's for you! 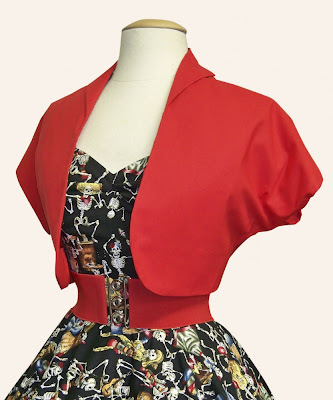 Now I have a decent bolero pattern, I will be making lots of little jackets to go with my Summer dresses, just like these cute ones from Vivien of Holloway! In other news... I cut out all the pieces for my Wartime Dress from Vogue 8936 and will be working on it this week! Look at you working with the original pattern pieces! That's awesome! Seeing that would make some sewing nazis cry LOL. You are teasing the hell outta me with that wardress! Make it already!!!! I love the new pattern. I made one of those 50s boleros before and they sometimes turn out ok, and other times they feel so constricted. I guess one with an underarm gusset would feel liek it has more movement. The pattern pieces are in great shape, but I'll probably just use them this once then make a tissue copy so I can preserve them, as I've got another two versions of this dress already planned so I don't want to overuse the original! Outfit post: new circle skirt! 1950s atomic box table thingy... all mine! Sewing plans: Wartime dress, and swimwear!